Activist and business owner Eula Johnson became the key figure in fighting for equality on South Florida beaches. Taking a stroll along the shores of Fort Lauderdale Beach, you’ll find people of all shapes, sizes and colors basking in our slice of paradise. But, there was a time when the color of your skin would determine whether you were allowed to frolic on the sand off Las Olas Boulevard. 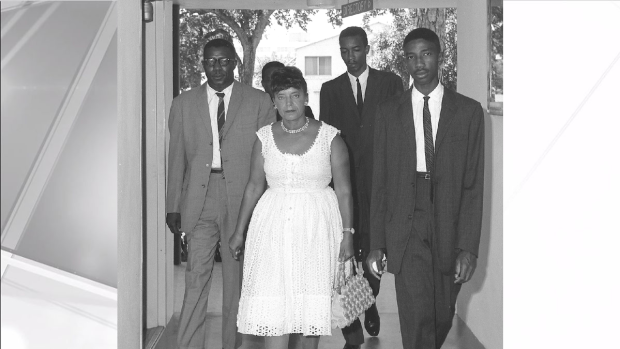 Activist and business owner Eula Johnson became the key figure in fighting for equality on South Florida beaches. Some people called her the Rosa Parks of South Florida. 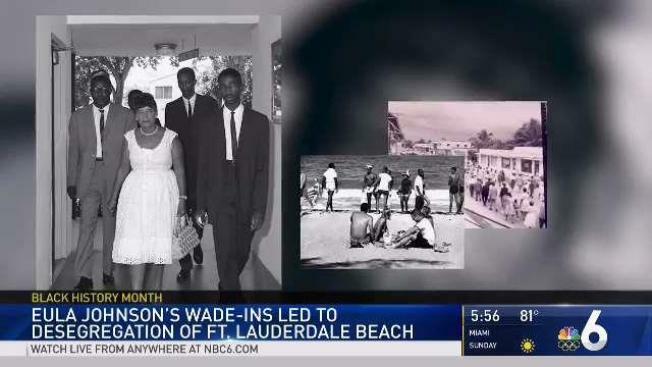 Johnson planned wade-ins at Fort Lauderdale Beach during the summer of 1961, even when the Ku Klux Klan threatened to ambush the protests. Tony Thompson, a historian at the Old Dillard Museum in Fort Lauderdale, researched Johnson’s journey to desegregate the beach. He said he learned about Johnson and her efforts through interviews with people in the community over the years. “I put her right up there with Martin Luther Kings, you know, the other civil rights leaders, because she had the same courage,” Thompson said. Johnson became the regional president of the NAACP in 1958. On July 4, 1961, she led her first wade-in at Fort Lauderdale Beach along with fellow activist Dr. Von D. Mizell. 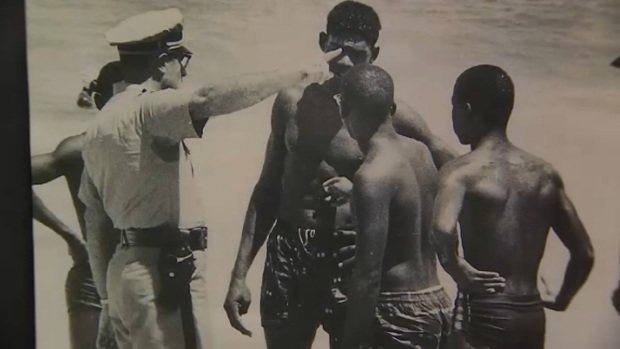 A group of African-American protesters approached by a police officer on Fort Lauderdale Beach during Segregation in 1961. Courtesy: Old Dillard Museum. Thompson said no one bothered the protesters and there were no arrests. Images of that first wade-in are on display at the Old Dillard Museum. Johnson’s efforts were challenged by whites who opposed integration. Johnson did not give in to the offer and continued her fight. She planned another wade-in on July 23, but she got a tip that the KKK had plans to disrupt the protest. “She called the FBI, she was smart,” Thompson said. She went on with the protest, but tensions were high. Eula Johnson pictured in the center. Johnson held several more wade-ins after until the City of Fort Lauderdale filed a lawsuit against her, claiming that she causing chaos and becoming a public nuisance. The case went to a federal judge who sided with Johnson. “The federal courts decided that since colored people paid taxes just like everybody else they deserved to use public beaches just like any other citizen,” said Thompson. Johnson put her life on the line to crush racial barriers on the shores on South Florida. “She was courageous, and accomplished a feat that nobody thought she would accomplish,” said Beauregard Cummings, 92. He played youth football with Johnson’s son. Cummings said as a teen, he watched in awe as the activist refused to back down. “I don’t think enough people do know about the people who helped to bring us where we are today,” said Thompson. Johnson died in 2011 at the age of 94. In 2016, Broward County’s colored beach during Segregation – John U. Lloyd State Park -- was renamed for Eula Johnson and Dr. Von D. Mizell.